1 of 3 Season pork chops on both sides with salt and pepper. Coat both sides in flour. 2 of 3 Heat oil in a large skillet. Brown chops for about 2 to 3 minutes per side, in batches if necessary. 3 of 3 Mix together pineapple, ketchup, vinegar, brown sugar, soy sauce and Worcestershire sauce. Pour over chops. Cook, covered, over low heat for about 30 minutes or until chops are tender. Add a little water if necessary during cooking if sauce becomes too thick. 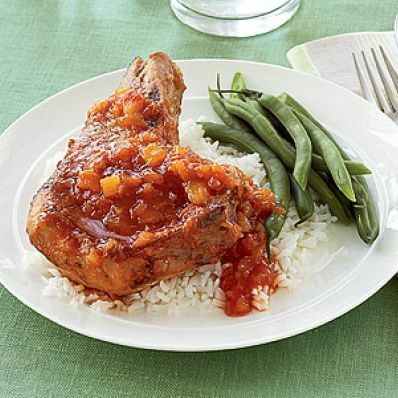 Serve with white rice and green beans, if desired.